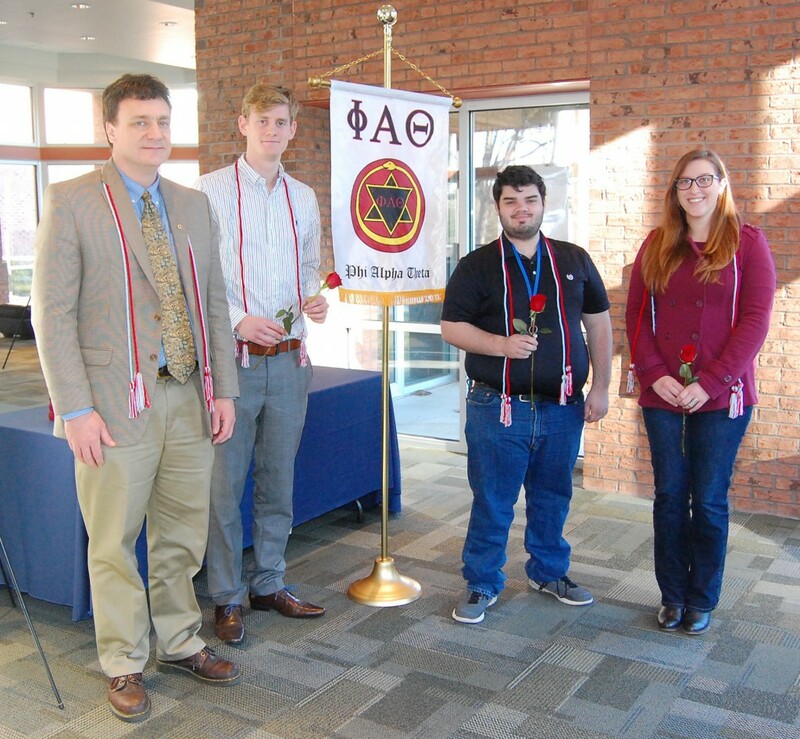 It is with great pleasure that the Reinhardt history program announces that three worthy students have been inducted into the Reinhardt chapter of Phi Alpha Theta, the honor society for students of history. From left to right: Dr. J. Good, Daniel Carpenter, Zach McElveen, Kaitlyn Gibson. Photo: Lauren Thomas. The ceremony took place yesterday in the Glass House. The new initiates received their certificates, honor cords, and roses, and learned the meaning of esoteric symbolism of the Phi Alpha Theta insigne (seen on the banner). Current members Alex Bryant and Brandi Allen and alumni members Barbara Stamey and Caitlan Sumner were also in attendance. 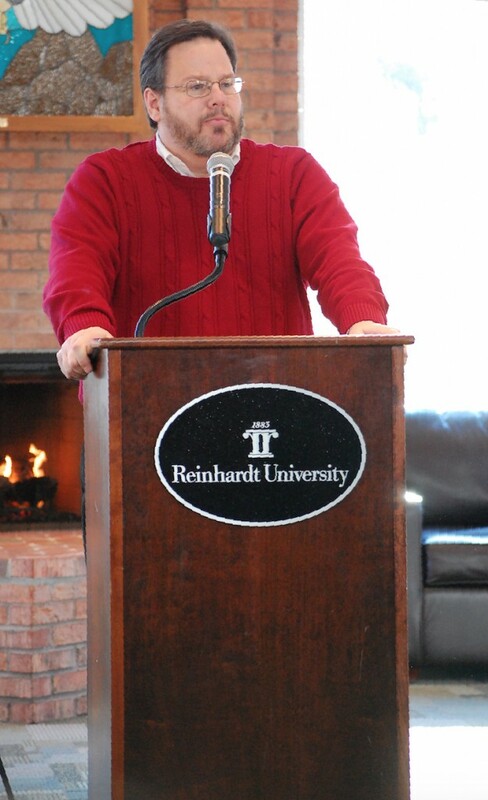 Patrick Zander, assistant professor of history at Georgia Gwinnett College (and formerly of Reinhardt) was our guest speaker. He delivered a very interesting talk entitled “TWA, African Development, and Breaking the Color Line in 1950s Kansas City (1946-1954).” This paper dealt with how Trans World Airlines was commissioned to set up a national airline in Ethiopia, and how a TWA executive (Zander’s own grandfather) forced Eddy’s Restaurant to serve visiting Ethiopian executives, in defiance of the conventional segregation of the time. Mr. Eddy himself was in a bit of a quandary: he did not want to risk alienating the biggest corporation in town (nor to court the wrath the Eisenhower administration), but he also did not want to risk a walkout by all his other white customers. His solution: he had the band play a drum roll and the MC announce the presence of “our honored guests, the Ethiopian cabinet!” It worked, and although not particularly momentous, the incident did represent a small victory for desegregation in 1950s Kansas City. Congratulations again to our new inductees! The next Phi Alpha Theta event will be the Georgia Regional Conference, scheduled for March 28 at RU. This entry was posted in Africa, Civil Rights, History Program, Phi Alpha Theta, Twentieth Century, United States by jgood. Bookmark the permalink.